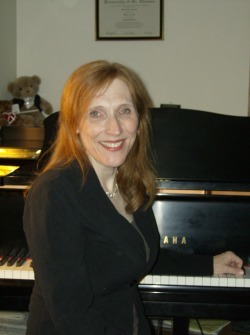 Deanna Andersen has taught piano to students of all ages for 34 years in the Twin Cities and Faribault, MN. She holds a Master of Arts degree in Music Education - Piano Pedagogy from the University of St. Thomas, MN, and received her Bachelor of Arts degree in Piano Performance from Simpson University, CA. A nationally certified teacher, she is an active member of the MN Music Teachers Association, St. Paul Piano Teachers Association, the Minneapolis Music Teachers Forum, the National Guild of Piano Teachers, and the MN Federation of Music Clubs – all providing many ensemble and performance opportunities for her students to cultivate a love for music and develop musicianship and performance skills. She has also enjoyed serving for many years as President of the "Salon Se Lève" concert series, which seeks to renew the salon concert to encourage emerging young artists. Deanna resides in St Anthony Village, Minnesota with her husband, Randy. Their three daughters live in New York, North Carolina, and Florida. "As a parent, I look for a teacher who is kind, patient, fun, and skilled. Deanna is all of these things. She is a fine pianist, and makes teaching an art. My kids always look forward to lessons with Deanna because she creates a fun learning environment. She is caring, positive, encouraging, flexible, and professional. I highly recommend her to others." "Our son Henry was bored with piano and about to quit in the 2nd grade when we met Deanna Andersen, who truly lives up to her motto: 'Making Learning Music Fun.' Fast forward ten years to his senior year in high school. By giving Henry a variety of music he likes to play, plus motivating him with frequent judged recitals and competitions, Deanna has developed Henry into a fine pianist who enjoys making music at an advanced level! He also composes with great imagination, using the foundation in theory she has systematically given him. Our 15-year-old daughter Maria has also taken from Deanna, but since she aspires to be a vocalist, Deanna geared her lessons toward being an able note-reader and self-accompanist, rather than a competitive concert performer. Deanna respects this variety in her students and flexes with their individual goals. Just as important, I've never heard a shaming, discouraging word from Deanna. She never harms their spirits. Some of this excellence stems from Deanna's doctoral-level training in piano pedagogy. More of it comes from her active leadership in the Minnesota Music Teachers Association (MMTA) and Minneapolis Music Teachers Forum (MMTF). But first and foremost, Deanna is a great teacher simply because she is a person of wonderful character. She's nothing less than an ally in raising our children and has become a close friend of our family." "My daughter has been studying with Deanna since she was in the first grade. Deanna is a wonderful and dedicated piano teacher. I have been constantly amazed at how patient she is. As a professional musician and teacher myself, I have really valued Deanna's holistic approach. She encourages students to develop fully as musicians rather than simply teaching piano. Theory, technique, posture, and expression all blend seamlessly in each lesson. Students are provided with many opportunities to perform and compete, which gives them goals. She goes out of her way to create ensemble opportunities - something especially important for young pianists, as public school music programs rarely have the resources to support this. "I have been particularly impressed with how responsive she is if my daughter or I have questions. As a parent, it is not always easy to navigate the treacherous waters of helping one's child practice. Deanna has been there with her own children, and has been a wonderful source of support when either my daughter or I are frustrated. Her detailed practice sheets are one of my favorite tools for avoiding conflict. I have recommended Deanna to many parents over the years, and will continue to do so in the future." "Each time I watch your students perform, I'm struck by how enthusiastically and energetically each one approaches the piano to play their pieces. I can tell they're used to having fun with music! And seeing their teacher have fun with music and play so beautifully is inspiring! Our granddaugther loves you!" "Thank you, Deanna, for a very fun and educational camp! Your teaching is such a great example of the principle of learning working best when kids - or adults - are having fun! Reena loved it and apparently made a new friend in Sabyl." Our gratitude is enormous for the guidance you provide for Eveny and Cormac. Music is a lifelong joy, and we appreciate that you partner with us to instill this love in their lives. Moreover, thank you for your expertise and encouragement to help them develop their God-given gifts. We feel fortunate to be a part of your studio - a place they can learn, make mistakes, expand their knowledge, and achieve goals. You meet and gently nudge them where they are! You can never know how much we value your approach!